In the first week of December, all roads lead to Oslo and Stockholm, where the year’s Nobel Laureates are swept up in a whirlwind of activities that culminates in the Nobel Prize Award Ceremonies and the Nobel Banquet. These memorable events are recounted here by the Laureates. “Nobody who has shared in them will ever forget them”, said Seamus Heaney, Literature Laureate, in his Nobel Banquet speech at the Stockholm City Hall in 1995. “It is as though I have been cast as an actor invited to take part in a production and not quite knowing his lines”, was how Aaron Klug, 1982 Nobel Laureate in Chemistry, described his initial reaction. Pierre-Gilles de Gennes, Nobel Laureate in Physics 1991, paid tribute to Sweden in his Nobel Banquet speech. Not until 1974 did Alexandr Solzhenitsyn get an opportunity to come to Sweden to attend the Nobel Prize Award Ceremony. Listen to his Nobel Banquet speech (in Russian) or read a translation. “I am dining with the King and Princesses in a golden hall, surrounded by the gracious ladies and gentlemen of their court” – read the Nobel Banquet speech of Russian-born Wassily Leontief, Economics Laureate in 1973. 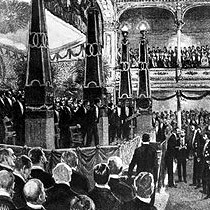 “Suddenly, except for the candles on the tables, all the lights in the Great Blue Hall were extinguished” – read how Philip S. Hench, Nobel Laureate in Physiology or Medicine, experienced the Nobel Prize Award Ceremony and the following Nobel Banquet at the 50th anniversary of the awarding of the Nobel Prize. Medicine Laureates Linda Buck and Richard Axel share some of their memories of the Nobel Day 2004. The pleasures of being in Stockholm are shared here by Alan L. Hodgkin, Physiology or Medicine Laureate 1963, in his Nobel Banquet speech. After the solemn Nobel Prize Award Ceremony comes the Nobel Banquet, with music and dancing. Have a look at Literature Laureate Günter Grass’s photo gallery.